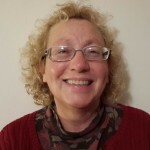 Leah Kayman was born and raised in St. Louis, Missouri and attended Camp Ramah in Wisconsin where she began to learn trope for Torah, Haftarah and Megillot. After returning from Young Judaea Year Course of 1973-1974, Leah received her B.A. in Communications and in Dairy Science from the University of Wisconsin while living at Kibbutz Langdon, a Jewish co-op/chavura with Judith Edelman and future husband Jeff Rosenzweig. In 1977 she made aliyah, settling at Kibbutz Ketura, where she has lived ever since. A founder of the Keren Kolot Jewish Studies Institute, Leah has been involved in informal education all her adult life. While working with the garinim of Noam at Ketura, Leah met both Tamar (z"l) and Oded Dvoskin.